Magic is a wonderful hobby. I have selected superb magic tricks, most of which can be performed with simple everyday objects. Once learned, you will be able to mystify and entertain no matter where you are. Read and follow the illustrated instructions carefully and regularly practice and rehearse the tricks until you feel completely confident - then get ready to baffle, bewilder and amaze! But remember our magicians code and NEVER REVEAL YOUR SECRETS! Have Fun! If you want latest easy magic trick subscribe now! Effect: You mend a broken necklace by magic. 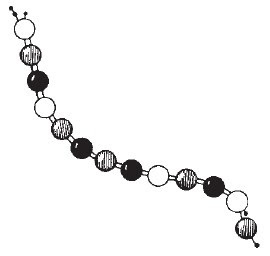 Secret: There are two threads in the necklace – one through all the beads and the other through all but one. Tie one knot at the top of the short thread and two knots on the long thread. Show the beads then cut off the bottom bead. The beads slide off the long thread into a glass on your table. It looks as if the beads are all separate. Pretend to drop the loose thread into the glass but secretly keep it in your hand. Make a magic pass and then show the beads magically rethreaded. 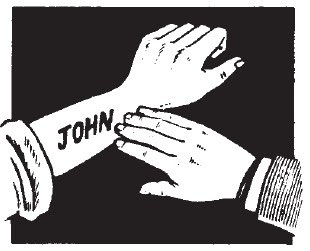 Effect: Someone's name mysteriously appears written on your arm. Secret: Secretly find out someone's name and write it on the back of your forearm with a piece of soft soap before you perform this effect. This will be invisible to our audience until your rub some cigarette ash or soot over it. At the appropriate moment during your performance, you can dramatically reveal this name! Effect: A spectator's initials appear on his own hand. Secret: Hand someone a soft pencil and ask him to print his initials on a sugar cube. Take the sugar and secretly press your thumb against the initials. Drop the sugar in a glass of water. 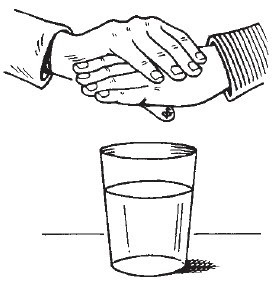 Ask the spectator to hold his hand over the glass. To show him what to do, you guide his hand over the glass. As you do this, press your thumb against his palm. You have now transferred a copy of the initials to his palm. He will receive a surprise when he sees the initials on his palm. Effect: A spoon is bent and then straightened again. Secret: Take the spoon in your left fist. Position the bowl so it rests on the table. Move your right hand over the left and change the left grip to hold the spoon by third and little fingers. As you pretend to press the spoon against the table top, bring your hands up to a vertical position as if really bending the handle. Move the hands back and forth as if the metal is becoming really supple. Blow on the spoon and throw it on the table. The handle is straight. Effect: A selected card is located within seconds. Secret: With a soft black pencil draw a diagonal line down both sides of a pack of cards. When you show the trick, you remove the cards from the case and ask someone to take any card, remember it and return it anywhere in the pack. Pick up the pack and look at your pencil mark. At one point there will be a small back mark out of alignment with the rest of the line – that is the chosen card. The magic tricks on this blog is for information purposes only. Our main purpose is to give entertainment hobby to our visitors, and make readers family & friends entertain and amaze through magic tricks. If we are infringing on anyone's copyright, please contact us by sending email on [worldofmagic316 at gmail dot com]. We will either remove the material or give credit to the deserving party.